Are you hoping to cut costs for your upcoming wedding, whose guests consist mostly of family members and close friends who won’t have to fly in from out of town? Then why not have a potluck reception? There’s something thoroughly communal and exciting about potluck that brings people closer together. Instead of gifts, guests bring and share their signature dish–traditional wedding etiquette be damned. 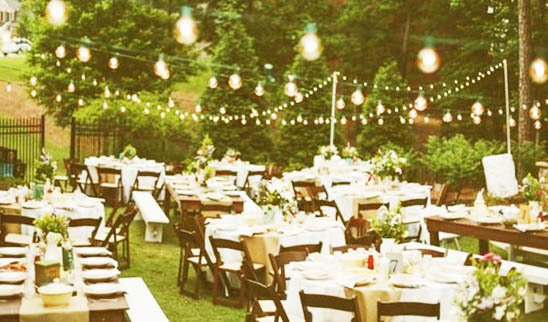 Here are four awesome ideas for a memorable potluck-style wedding reception. 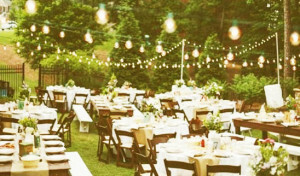 Is a potluck wedding reception feasible? If yours is a small backyard wedding that is more or less a family get-together, then go ahead and do a potluck. A potluck reception is most suitable for a casual, laid-back affair. As for the nitty-gritty of the potluck reception etiquette: no dollar dances and no bridal registry. The dish that a guest brings to the reception–that’s the gift. And don’t obligate guests to bring dishes. If there are invitees coming in from out of state, be considerate and tell them they don’t have to bring food to the reception. Don’t forget to write thank-you notes even for those who decided not to bring anything. Aside from providing the utensils, plates, buffet-style warmers, and other essentials, be prepared to serve the main dishes. Think barbecue reception, where you offer the grilled meats and the breads. Then your guests can bring a variety of side dishes and salads to complement the main fare. Or how about a Tuscany-themed buffet spread, where delicious Italian foods are on offer? Other viable themes to consider include vegetarian, gluten-free, and Asian-inspired cuisine. When you ask guests about what food they plan to bring, you might also want to get the recipes for those dishes. Compile the recipes into a “cookbook” to give to any guest who might be interested. Don’t forget to plan where you’re going to source the drinks. Some guests who are not into cooking can bring drinks such as gallons of lemonade or mixed drinks. Shop for drinks in bulk, as well, so there will be enough for everybody. Some people will frown at the concept of a potluck wedding reception, but it can work beautifully if the circumstances are right. A potluck wedding reception can be hosted in good taste. It all depends on how it’s done. You can get your invitations done by using mulberry paper materials which is environment friendly and cheaper than luxury silk wedding invitation boxes. DIY cards can be great fun and cut cost, too!